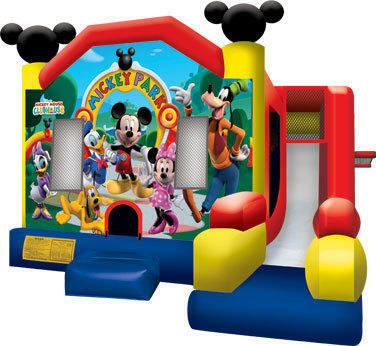 M.I.C.K.E.Y M.O.U.S.E...This Mickey Park 7 In 1 Large Combo Design Bouncer has 7 activites in one jump. vertical obstacles,horizontal obstacles,basketball hoops inside and outside,very spacious jumping area, climbing wall to the big slide. Bright colors with graphic print of characters. Mouse ears atop. It features an inflatable safety ramp at the entrance to protect excited kids as they scramble to get inside the bouncer. It also has large netted vent windows that keep things cool for the kids and allows parents to keep a watchful eye on all activities inside. Basketball not included, please select from our "Party Extras" to add to cart. Appox 8-10 users at a time.